Coast Diamond is proud to call Roberson’s Fine Jewelry of Little Rock, Arkansas our Featured Retailer of the Week. Roberson’s Fine Jewelry loves the way you love. To help you love at your very best they bring you the most fashion forward and brand conscious shopping experience not just in Little Rock, but in the entire country. This family business is headed up by Trish Roberson who ensures that the company is run with their guiding principles of great service to create an amazing experience for their customer. Roberson’s Fine Jewelry is a nominee for JCK Magazine’s 2016 JCK Jewelers’ Choice Award. Keep your eye out for the results, because with all the positive feedback Roberson’s receives online they are surely a strong contender. How do you love? Is it with one of these Coast Diamond engagement rings? Stop into Roberson’s Fine Jewelry today and choose one of these stunners for your sweetheart and a Valentine’s Day proposal. Congratulations Roberson’s Fine Jewelry for being Coast Diamond’s Featured Retailer of the Week! Coast Diamond is delighted to present Rhudy’s Jewelry Showroom of Fayetteville, NC as this week’s Featured Retailer. When you visit Rhudy’s Jewelry Showroom’s webpage, About Us, you read about a son’s pride in his father’s business and his commitment to continue what his father started. Rhudy C. Phillips tells us about the humble beginnings of his father, Rhudy, on a farm in Virginia. He went on to enlist in the Army as a medic when he was just 17 years old and upon leaving the military Rhudy went to college and became an accountant. He really missed working with people, so with the simple idea that “Jewelry is memories” Rhudy’s Jewelry Showroom was born. Rhudy began selling gold chains, rings, charms, and bracelets out of cigar boxes in an invitation only “little blue colored jewelry showroom.” During Christmas of ’81, that blue showroom was so full of customers for the entire month of December, you couldn’t move. In ’83 the blue showroom moved to what is still Rhudy’s Jewelry Showroom in Fayetteville, NC. Rhudy’s son, Rhudy C, carries on his father’s promise of honesty, integrity and respect of his customers that come from all over the country. With Valentine’s Day around the corner Rhudy’s is sure to be busy as usual with customers looking for that special piece of jewelry for their loved one. If a Valentine engagement is in the near future for you, stop into Rhudy’s Jewelry Showroom and try these Coast Diamond halo engagement rings on for size. Congratulation Rhudy’s Jewelry Showroom for being selected Coast Diamond’s Featured Retailer of the Week! Coast Diamond is pleased to announce Komara Jewelers of Canfield, Ohio as Featured Retailer of the Week. This October, Komara Jewelers will celebrate 68 years in business serving the Youngstown area of Ohio. Three generation of Komara’s have carried the values first introduced to the community by Stephen Komara in 1948. When he opened the doors of Komara Jewelers he had one goal, to bring the very best quality in fine jewelry to his family and friends. Today Stephen’s sons, Robert and Tom, as well as Bob’s daughter, Brianna, continue the Komara legacy in one central location in Canfield, where they maintain their reputation as Northeast Ohio’s best diamond and jewelry value. Are you planning a Valentine’s proposal? Komara Jewelers is the ideal place for Ohioans to shop for a Coast Diamond engagement ring. Komara “genuinely and warmly invites you to get to know us and our special way of doing business.” Stop into Komara Jewelers today where you’ll find these and other Coast Diamond engagement rings. Congratulations Komara Jewelers of Canfield, Ohio for being selected Coast Diamond Featured Retailer of the Week! Coast Diamond is happy to present Farley’s Jewelers of Hanover, PA as the Coast Diamond Featured Retailer of the Week. Ernie Farley was in the right place at the right time – high school – when the local jewelry store came looking for individuals to train in the field. He took the local jeweler up on the offer and began as a stock boy. As Ernie’s career progressed, he found himself traveling for the East coast company doing everything from sales manager to jewelry buyer. In 1971, Ernie earned his certification as a diamond appraiser from the Gemological Institute of America. Interesting fact: Ernie’s first child, Erik, followed in his father’s footsteps and was one of the youngest to be admitted into the GIA at the age of seventeen. “I strongly believe the only way we are able to keep our gifts is to pass them on,” says Ernie Farley. Not only is that evident as his son follows in his footsteps, but Farley’s Jewelers also has very little turnover in staff. It is in educating them and building confidence with the customer that Farley’s has enjoyed steady growth in the community. Coast Diamond is proud to be a designer carried in Farley’s Jewelers. 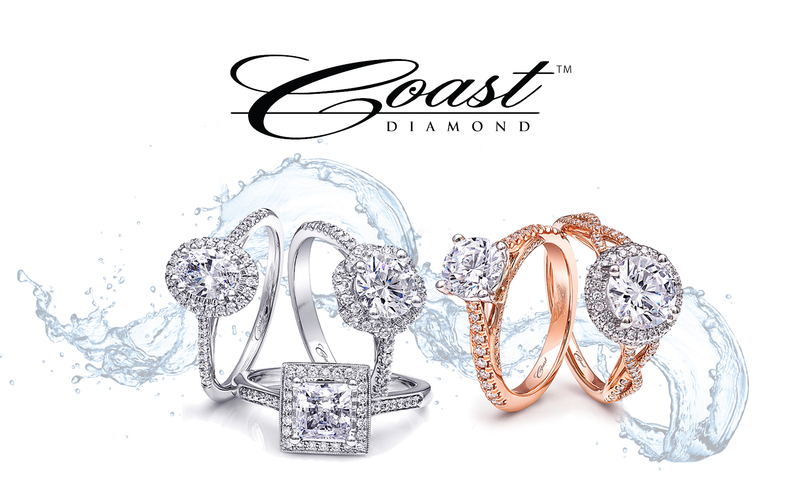 Giving the gift of a Coast Diamond engagement ring can only be done with the help of someone willing to share their gift of knowledge about jewelry with the customer. We encourage you to stop into Farley’s Jewelers and personalize one of these Coast Diamond engagement rings with the help of Farley’s staff. Farley’s Jewelers: Coast Diamond 1.5CT engagement ring with diamonds down the shoulders (LJ6033) and matching wedding band (WJ6033). Congratulations Farley’s Jewelers for being Coast Diamond’s Featured Retailer of the Week!